Here’s a direct-fit VHX package for those 1968-70 Mopar B-bodies that didn’t get the Rallye dash. Installation is easy since this unit is a direct fit and utilizes your stock instrument surround and dash pad. Inside the system, a single large LCD message center allows the driver to see just what they need when they need it. Six analog-sweep instruments provide more information than dreamt of back in ’68, and all the important indicators are built in too! *Bezel shown in any pic is NOT included, shown for illustrative purposes only. System uses OEM or reproduction style bezel. This 6-gauge system includes a new, fully-machined rear gauge housing, attaching directly to the stock metal dash framework, then overlaid by the stock trim bezel. Fully lit needles, backlit faces, and highly visible LCD message centers are a few of the things that you can see which set the VHX Series apart from yesterday’s traditional approach to instrumentation. A few of the features which you don’t normally see are the micro-controlled precision stepper motors, solid state sensors for unparalleled accuracy, and user-customizable display feedback, all supported by an unrivaled limited lifetime warranty which has become the standard for Dakota Digital instrumentation systems . Completely engineered and manufactured at their facility in Sioux Falls, South Dakota, the VHX Series has completely revolutionized the instrumentation industry! Lighting - Back lit technology is popular with performance instrumentation due to precise lighting allowing you see what is truly important when you really need it at a quick glance. Each number, tick mark, annunciator, needle, indicator and digital message center is lit by a series of LEDs behind the gauge face. Auto-contrasting LCD display for optimal view in the brightest of sunlight. LED backlit at night to match/complete the look at night. Water Temperature - 1/8" NPT, ground isolated sensor with a 10 ft harness. Oil Pressure - 1/8" NPT solid state sensor with a 10 ft harness. Cable Drive Speed Sensor/Generator - Replaces GM style speedometer cables with a 10 ft harness (Tremec and Ford style adapters available upon request). Bushings - Each kit comes with 1/8" to 1/4", 3/8" and 1/2" NPT bushings along with bushings for 12mm and 16mm x 1.5 threads. Pushbutton - Dakota Digital instruments are programmed and operated by the push of a button. Simply mount the included pushbuttons supplied with your gauges in a convenient and easily accessible location. These buttons are used to calibrate your speedometer, set the cylinder count and the fuel level gauge. Once properly configured these same buttons are used to access the wealth of information located in the Digital Message Centers. More info about this system and pics are available below. 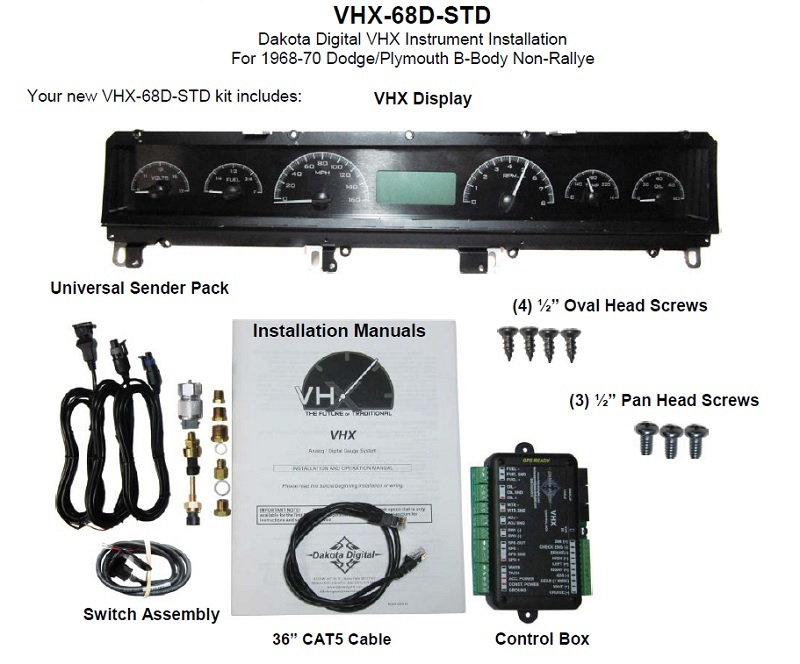 This listing is for ONE VHX gauge system with your choice of style and backlighting color. Please let us know your options when you make your purchase. Metric system (KM/H and degrees Celsius) is available as a custom option (no additional cost) but may take 4-8 weeks to build.